Peter Schreyer, right, in New York on Wednesday: “Korea, of course, has a very hierarchical attitude and you have to adjust. But I was used to this with Mr. Piech, also.'" NEW YORK -- South Korea’s Hyundai Motor Group wants to be known for world-class -- not just cheap -- cars, and one of Germany’s top designers is helping lead its transformation. Peter Schreyer, a president of the company that controls Kia Motors Corp. and Hyundai Motor Co., made his mark at Volkswagen AG, where he began his career. His 1998 design for the TT roadster influenced a whole generation of German stylists. He also was the top designer at Volkswagen, where he oversaw development of the 1997 New Beetle. Six years after he left, former Chairman Ferdinand Piech told reporters he regretted letting him go. Schreyer’s boss now is Chung Mong Koo, the autocratic billionaire who controls South Korea’s two largest automakers. Chung encourages fierce competition between the Seoul-based manufacturers and typically keeps Westerners like the Bavarian-born Schreyer far from the corridors of power. But combined sales at the two companies more than doubled to 8 million cars and trucks between 2006 and 2015 after Schreyer started designing for Kia. He became lead designer at Hyundai in 2013 and now oversees a network of studios on three continents. The Genesis New York Concept unveiled Wednesday. On Wednesday, Schreyer, 62, unveiled important prototypes at the New York auto show. 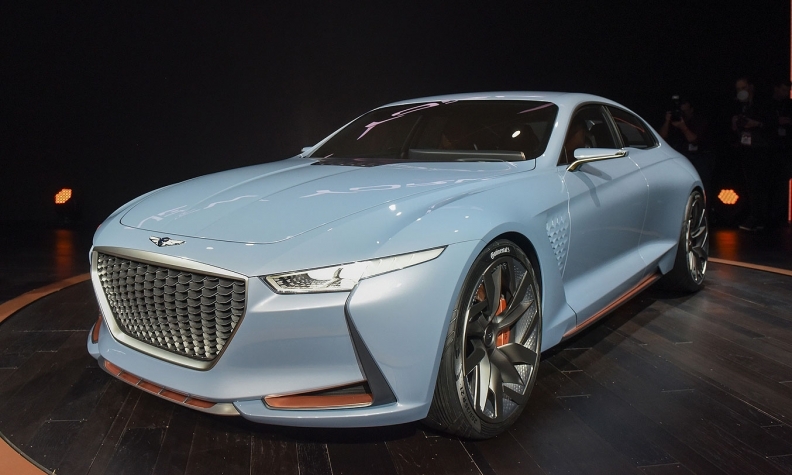 One is a concept sports sedan Hyundai’s new Genesis luxury line will aim at high-end models by German manufacturers including BMW and Mercedes. The other is a Cadenza sedan Kia will use to challenge full-size cars such as Toyota’s Avalon in the U.S. He also watched as subordinates introduced Ioniq sedans he helped design. They will be sold either as hybrids, plug-in hybrids or battery-only models. Chung acknowledged the critical role of automotive designers in general, and Schreyer in particular, by naming him as the first waiguk-saram, or foreigner, among seven Hyundai Motor Group presidents in 2013. In the process, he cemented Schreyer’s status as one the world’s most influential stylists, Harrow said. Schreyer said he feels an emotional, not just professional, attachment to the Chung family -- but there’s no doubt who’s the boss, nor should there be, given how the elder Chung built Hyundai into a global powerhouse. The Genesis concept was revealed Wednesday in New York. An unusually long hood seems to push the passenger compartment back toward the big rear wheels. With his firm grip on design at Kia and Hyundai, Schreyer needs to keep their identities distinct: Kia embracing a youthful, sporty image and Hyundai moving toward a more traditional, German form of elegance. In January, he helped launch Hyundai’s Genesis as a free-standing unit. After years of studying such a move, the company has been forced to seek luxury-car revenue more aggressively, said Alan Baum, an independent auto analyst. That same month, Hyundai and Kia forecast their weakest sales increase in almost a decade as a slump in Chinese demand and a stronger won cut profits. Even under such pressure, Schreyer maintained a friendly, relaxed demeanor at the New York auto show on Wednesday. He was dressed, as always, in a black suit with a black shirt, plus a black ascot with white polka dots. His glasses had black 3D-printed Mykita Mylon frames made in Germany. The interior of the blue Genesis concept he showed off had a curved, 21-inch information and entertainment screen that floats above the dashboard. The roof slopes sharply down toward the trunk. An unusually long hood seems to push the passenger compartment back toward the big rear wheels. “This stance says ‘muscular, capable and safe,’ but it’s inefficient from an aerodynamic and engine-packaging point of view,’’ said Eric Noble, a professor of vehicle technology at the ArtCenter College of Design in Pasadena, Calif. The roof of the Genesis New York Concept slopes sharply down toward the trunk. 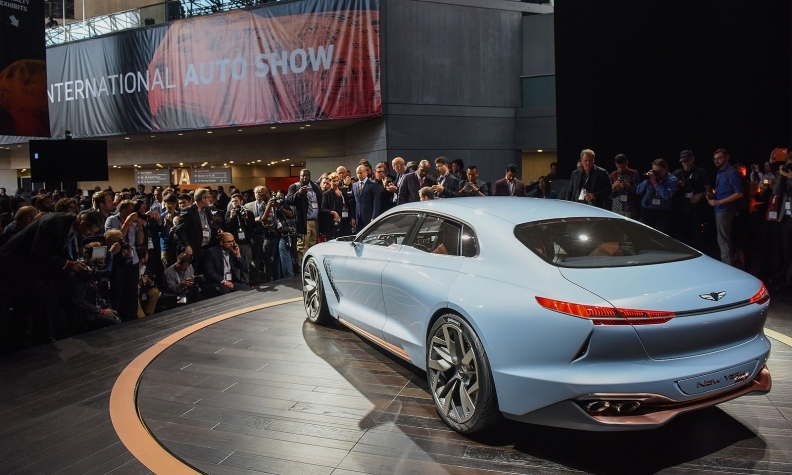 Hyundai’s willingness to approve it anyway shows the deep commitment Chung and his son Chung Eui-Sun have made to aggressive automotive styling, Noble said. Eui-Sun, now Hyundai’s vice-chairman, recruited Schreyer to Kia in 2006. Noble also praised Schreyer’s attention to small refinements, such as door handles that fit flush with the car’s surface. He described the gaps between the car’s tires and fenders as the smallest he’s ever seen. This precision, he said, contributes to an overall feeling of refinement. Schreyer studied vehicle design at the Royal College of Art and is one of only three people to receive the school’s honorary doctorate. The other two are Italian design icons Sergio Pininfarina and Giorgetto Giugiaro. When he first arrived at Kia, he created a so-called tiger-nose grille that became the company’s design trademark. The Cadenza sedan he presented Wednesday contained variations on this theme: a hexagonal shape and, on some models, vertical slats that curve inward toward the engine. In the Wednesday interview, he said he brings two kinds of discipline to his job. The first is to focus design on the car’s functions rather than some beautiful flowing lines he happened to draw on a piece of paper. The second is to know when to stop fighting for even small refinements, since they can disrupt engineering and manufacturing. Throwing his hands up, he compared this to a Formula 1 race-car driver who lets go of the steering wheel during a pit stop so he doesn’t drive off as the tires are being changed. In 2008, he led design work on a new Kia Optima sedan. Two-thirds of the owners said they loved the exterior styling, compared with less than half for most mid-size cars, said Alexander Edwards, president of Strategic Vision, a San Diego company that conducts car-buyer surveys. The interior of the blue Genesis concept has a curved, 21-inch information and entertainment screen that floats above the dashboard. Hyundai’s pre-Schreyer designs were successful enough to help boost the share of U.S. buyers who said they’d definitely consider the brand to 20 percent in 2011 from 1 percent in 1997, Edwards said. But Hyundai opted for conservative styling on one of its new Sonata sedans, and by 2014 the share had dropped to 14 percent, Edwards said. That’s when Hyundai turned to Schreyer. The company faces a long road in building Genesis into a full-blown luxury competitor, said Eric Lyman, a vice president at automotive-pricing company TrueCar Inc. As evidence, he cites the failure of Honda’s Acura brand and Nissan’s Infiniti, despite years of trying, to match German marques such as Mercedes in sales and pricing power. The Koreans are taking aim at these brands and are “looking straight past Japan,” Noble said. Schreyer said he plans to accomplish this with designs regarded as the world’s best -- bar none. That’s why he’s busy poaching designers from Bentley and Volkswagen. At the end of the Kia press conference on Wednesday, Schreyer’s staff presented him with a cake in the shape of a gray Cadenza to mark the nearly 10 years since he arrived at the company. But he said there’s lots more to be done, particularly in getting the Genesis brand up and running. The company plans to introduce six new vehicles in the new few years, including sedans, crossovers and sports utilities.